Whenever we hear of forest fires, no matter where and no matter when, we hear of our armed forces fighting those fires. We’ve become used to seeing them arrive first on the scene, and leave last, only after containing the wild fires. Indeed, many of our forests have been saved thanks mainly to the bravery of our men in uniform. And so it was this afternoon, when a fire broke out in the forests above YHS. Our armed forces mobilized themselves in no time, and rushed to contain the fire that, fanned by the early afternoon winds, was spreading quickly in the dense pine forests. But tragedy struck. A truck, carrying more than 20 policemen, veered off the road as it tried to cut a corner in the narrow path leading to the forests. The truck’s brakes had failed. And it slowly plunged into the precipice below the road, all the way down to the YHS campus. The accident killed two policemen on the spot. And injured 17 others. The injured are recovering in the JDWNR hospital, but two of them are in critical condition. The tragedy seems senseless, given that they were on their way to protect us and our forests. It also seems cruel – the policemen on the ill-fated truck were all very young men, mainly teenagers, who had only recently completed their training and had reported for duty just yesterday. Like the rest of Thimphu, I’m mourning the loss of precious lives. My heart goes out to our police force, especially to the friends and relatives of the two policemen who died in the line of duty. Please offer your prayers for them. Please also offer prayers for the injured – may their recovery be quick and complete. Today, on the 24th of April, we observe Armed Forces Raising Day. On this important day, we commemorate the establishment of our armed forces comprising of the Royal Bhutan Army, the Royal Bhutan Guards, and the Royal Bhutan Police. And, more importantly, we remember and celebrate their valuable services to the tsa-wa-sum. 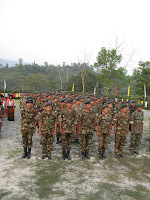 I respectfully offer my gratitude and tashi delek to the Supreme Commander in Chief of the Armed Forces and the Militia, and to all officers and troops of the RBP, RBA and RBG. I offer my condolences to the families and friends of the six people who were ambushed in Phibsoo, Sarpang yesterday. Four of them were brutally murdered and two are said to be in critical condition. My prayers and support are with them during this difficult period. This outrageous act was committed by terrorists, and is a direct attack on our nation. We must, as His Majesty the Fourth Druk Gyalpo has repeatedly commanded, “act and think as one” to defend the security and sovereignty of our nation. I will support, without reservation, the government’s efforts to catch the perpetrators of terror in our beloved land. I’ve just returned from a UN dinner to say farewell to the outgoing UNDP Resident Representative. In attendance were the prime minister, cabinet ministers, Speaker, Chairman of NC, secretaries to the government, constitutional post holders, heads of international agencies, and diplomats. As far as I could tell, this very distinguished group had assembled in a small room in the Hotel Riverview without any noticeable extra security arrangements. The terror attacks in Mumbai reminded me that this is not a good idea. Bunching our most important people together is risky. If we must, take the necessary precautions. Otherwise, sooner of later, we’ll be in trouble.